Put the oxygen mask on first. I never really understood the sacrifices mothers make until I became a mother myself. I didn't know how deeply and unconditionally you love your children. 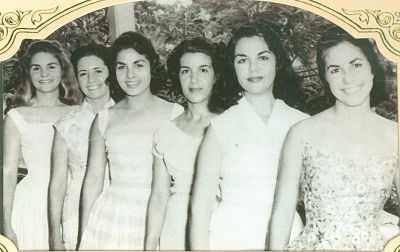 My mom is second from the right, with her five sisters. I look at how many women live a life that is not authentic for the sake of their children...in order to give them the best life. As a young woman, I judged the women in my life so harshly for not pursuing their dreams without understanding how difficult it is to do it all. Yet, I also now know that if we don't take care of ourselves (if we don't put the oxygen mask on first - as they say on airplanes), we are teaching our children the wrong things. To be all-giving without filling ourselves too, means we are suffering inside. Our sons will marry a "sufrida" woman if they have only experienced a suffering mom, and our daughters will become the unempowered us - not feeling that they are enough. So it's something to think about; what kind of woman do we want our son to marry or our daughter to become? That is the woman we need to be, we are their role model. How about becoming a self-made woman, self-actualized, "realizada”‎? Strong, self-loving, self-reliant! A few months ago I had a conversation with a woman I admire. She came and spoke to us at the Adelante event in Los Angeles at the La Raza conference about her book, "LEAN IN", and we had a conversation about becoming a self-made woman within a corporation. I send her my condolences today as she just lost her 47 year old husband, David Goldberg. She had found a man who helped her LEAN IN everyday. Our lives are an obstacle course that we need to learn to navigate. Things happen to all of us. I send Sheryl all my love. 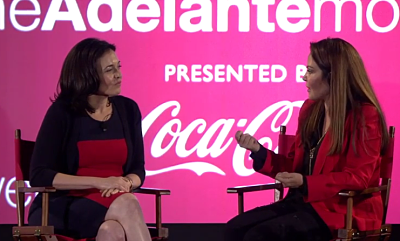 And for all of you, here are her words at our Adelante Movement event. Watch the video.